A heat pump is a device that transfers heat energy from a source of heat to a heat sink. Heat pumps move thermal energy in the opposite direction of spontaneous heat transfers. This happens by absorbing heat from a cold space and releasing it to a warmer one. A heat pump uses a small amount of external power to operate. The main components of a heat pump are a condenser, and expansion valve, an evaporator, and a compressor. The medium used to transfer the heat through all of the components is called refrigerant. Some examples of heat pumps are air conditioners and freezers, but also can be HVAC these are devices used for heating or cooling a space. For heating spaces a heat pump, they are basically the same as a refrigerator and air conditioner but, run in the opposite direction. Meaning they release heat into the conditioned space rather than into the surrounding environment, drawing heat from the cooler external air or the ground. The best way to understand how a heat pumps work is a Carnot engine running in reverse. Since the efficiency of a heat engine is , we see that . A heat pump always has more heat transfer than work put into it, so it means that is always greater than 1— Also . Knowing this helps us find out the . A heat pump is made up of 5 main components; a compressor, a condenser, an expansion valve, an evaporator and a refrigerant. The refrigerant is generally made up of Carbon dioxide, ammonia, or a halo-carbon. The cycle of a heat pump starts at the evaporator where heat is taken in from the outside medium in order to turn low temperature low pressure liquid into a low temperature low pressure vapor. Using outside energy input the compressor changes the low pressure low temperature vapor into a high pressure high temperature vapor. At the condenser the cooler outside air temperature takes heat energy from the system and causes the refrigerant to liquify. although the refrigerant lost enough energy to turn back to a liquid state it is still at a high temperature and high pressure. at the expansion valve the pressure on the refrigerant is lowered and it turns back to a low pressure low temperature liquid. The only point that the heat pump needs energy added in order to work is at the compressor. This requires a heat pump to be incredibly efficient. A typical air to air heat pump can produce about 3 KW of thermal energy for every 1 KW of input energy. This shows an efficiency of 300%. Technically this is not correct because much of that output is thermal energy from outside moved inside. Because of this, heat pump efficiency is described by a coefficient of performance. Coefficient of performance (CoP is defined as (valuable energy input/thermal energy output). A typical air to air heat pump has a CoP of around 2.5, a water to air heat pump has a CoP of 3.5 and a ground to air heat pump can have a Cop of 3.5 to 5. To put this into simple terms every KW of energy put in will put out 3-5 KW of thermal energy. Air source heat pumps do not require geothermal energy to operate, like geothermal heat pumps, nor do they require natural gas or other heating options like absorption heat pumps do. They require only electricity and access to the outside air. Because of this, they are the most commonly installed heat pumps in the world. An air source heat pump is very basic and is the standard example of a heat pump. The expansion valve contains a reversing valve as well, allowing the heat to either flow into or out of your home. Heat from outside enters or leaves the system via a heat exchanging coil, where it goes through compressor or expansion valve (depending on the if you want to heat or cool your home) and distributes throughout the home via ducts, underfloor circuits, or a water tank (4). It is also an option to attach a reverse cycle chiller to increase efficiency in homes where natural gas is scarce. A heavily insulated tank of water is installed near the evaporator and takes the place of the outside air. Based on the equation , the idea behind a reverse cycle chiller is that it is more efficient to cool or heat the water as needed in order for the heat pump to run at max efficiency than it is for the heat pump to run at low efficiency (such as cooling the home on extremely hot days.) This idea has been shown to work, and the cost of a reverse cycle chiller is offset by energy savings within 2 or 3 years (4). An air source heat pump is ideal when temperatures do not drop below 5°C (41°F). According to the equation , as the Qc value decreases, then the bulk of the heating must be done through electrical means. This greatly decreases the efficiency of the pump according to the equation (4). In cold temperatures, a regular air source heat pump’s coefficient of performance approaches 1.5. As air source heat pumps become more widespread, diesel use increases (1). To counteract this, special heat pumps known as cold climate air source heat pumps are used. These are more advanced heat pumps that have better compressors and evaporators that can keep a COP of 2.5 at even -30°C (-22°F), keeping a minimum COP of 1.5 at even colder temperatures (1)(2). A geothermal heat pump is one of the three types of heat pumps. It works on the same principle as other heat pumps except instead of relying on outside air or water temperature it uses the temperature of the ground. Ground temperature is more reliable than water or air because a few feet down it is always warmer than air in the winter and colder than air in the summer. A geothermal heat pump consists of the same components as a typical heat pump, a compressor, an expansion valve, an evaporator and a condenser. the main difference is that a ground loop is installed that brings the warmer (or cooler) temperature to the refrigerant in the heat pump. Geothermal heat pumps have a more expensive initial install cost than other heat pumps but they are more reliable and less maintenance intensive. The price of install is usually made up in energy savings in 5-10 years. Most components last 10-15 years and the ground loop (the most expensive component) lasts 50+ years! An Absorption heat pump are much like an air-source heat pump however absorption heat pumps are driven by a heat source rather than electricity. The heat sources that are commonly used include natural gas, solar-heated water, and geothermal-heated water. 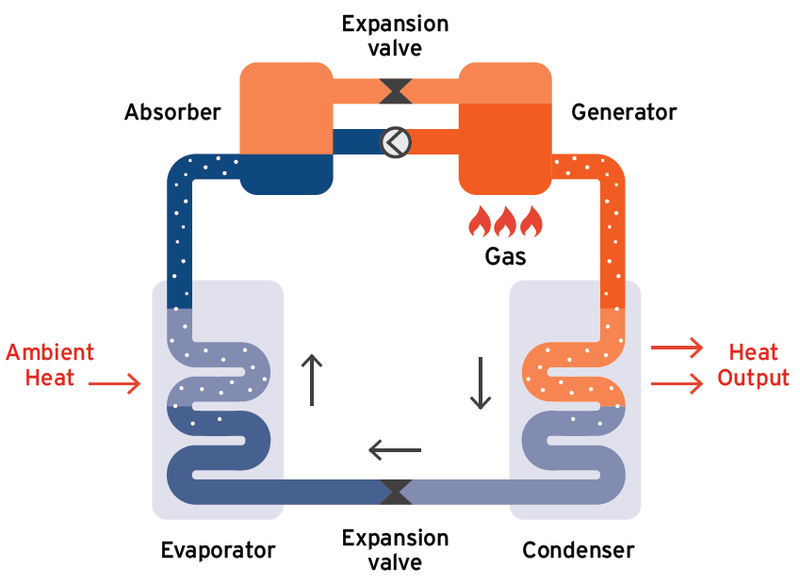 Most absorption heat pumps use a cycle with ammonia-water to provide heating and cooling. Like a regular heat pump cycle, the refrigerant is condensed to release heat or evaporated to absorb heat. What makes an absorption heat pump different is that instead of being driven by the pressure of a compressor the ammonia is first absorbed into water then pumped to a higher presser by a low-power pump. The heat source plays the role of driving the system and separating the ammonia from the water by essentially boiling the ammonia out allowing the cycle to start over and allowing the ammonia to be reabsorbed at the beginning. Like everything that is commercially produced, Heat Pumps have an initial environmental cost to be manufactured and installed. The largest threat to the environment however, is not its initial cost or cost of running the pump, but the refrigerant used within the pump itself. If a leak were to occur, although it is very unlikely, not only would the efficiency of the heat pump be reduced but the leaking refrigerant gas would be released into the atmosphere. 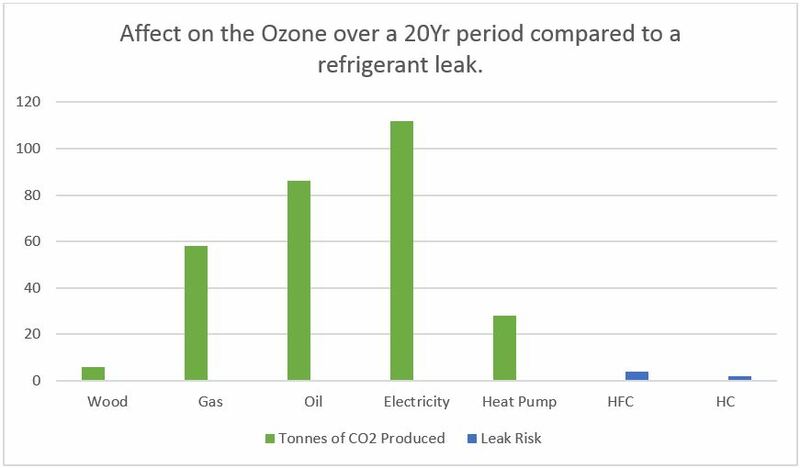 Shown below is the amount of impact on the Ozone if 2kg of refrigerant was leaked over the course of 20 years compared to the amount of CO2 produced by other space heating methods. The Coefficient of Performance (COP), or the amount of energy extracted per unit of electricity to operate, heavily influences the impact a heat pump has on the environment. The less energy required to run the pump, the less CO2 is released into the atmosphere. Below is a graph of COP of different methods used compared to the amount of CO2 released. The Green line represents Heat Pumps when paired with a renewable resource such as a Wind Turbine or Solar Panel to provide its electricity. Red represents natural gas, Black for oil, and Blue for general methods used by the government such as Nuclear and Coal. While air source heat pumps aren’t as efficient as geothermal heat pumps, they can be used anywhere with electricity. They are extremely efficient and useful in temperate climates, and, when used in conjunction with alternative heating methods, save energy in cold climates as well. Since they cost 2/3 as much money annually vs a natural gas furnace and require only electricity to operate, they are great for the environment as well as your wallet. 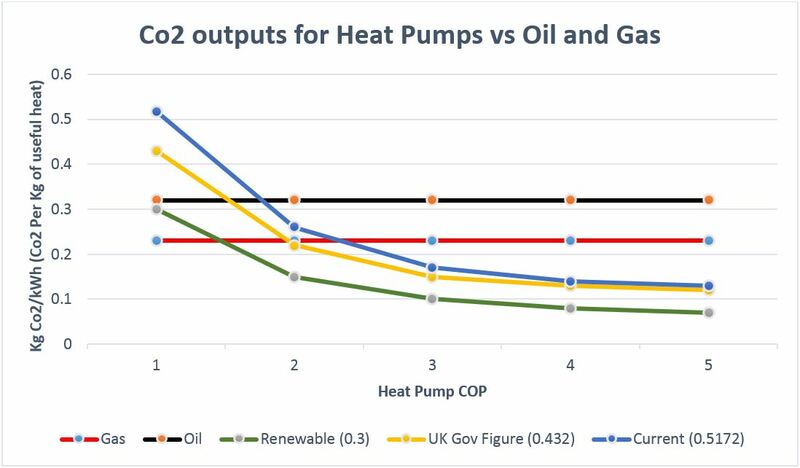 Absorption heat pumps are often not quite as useful for the common person, as they are more cost effective when large solar fields can be built, such as in large commercial developments (1). They are also effective in areas where no electricity is available, or can be used instead or in conjunction with geothermal pumps, as geothermal heat can heat up absorption pumps as well. Geothermal pumps, however, cost 1/2 as much annually as air source heat pumps and are the much better option where available. These pumps are both cheap when used long-term and are extremely environmentally friendly, so they are far and away the best option for heat pump heating. (1) “Solar Cooling.” www.solid.at. Archive.2018. Image: “Geothermal Heating & Cooling.” Web. 2018. (1) Government of Yukon’s Energy Solution Centre and Yukon Energy, Mines and Resources. “An Evaluation of Air Source Heat Pump Technology in Yukon”. PDF. 31 May 2013. (2) Natural Resources Canada (Government of Canada). “Performance Testing of Cold Climate Air Source Heat Pumps”. PDF. May 2017. (3) Rosenthal, Elisabeth; Lehren, Andrew. “Relief in Every Window, but Global Worry Too”. New York Times. Web. June 20, 2011. (4) U.S. Department of Energy. “Air Source Heat Pumps”. Web. 2018.